Our licensed and trained garage floor epoxy contractors have decades of combined experience working with epoxy to deliver superior results that stand the test of time. An epoxy garage floor coating is a cost-effective and easy way to transform your garage from dusty and dark into bright, clean, usable space. Ready to see what your garage can become with the right floor system? Here’s what our epoxy garage floor installers in Austin, Texas have to offer. Garage epoxy is often mistaken for paint but it’s actually a combination of epoxy resin and hardeners that combine to form a chemical reaction. When the epoxy cures, it becomes an incredibly hard-wearing plastic surface that can handle even heavy abuse. Epoxy bonds with your concrete substrate to increase the tensile strength of your concrete and protect it from stains and damage. Professional garage floor epoxy isn’t just attractive; it can last up to 20 years with little care. Not all garage floor epoxy contractors in Austin, TX are equal. Unfortunately, greater awareness and demand for garage epoxy has led to an increase in the number of fly-by-night epoxy installers who rush through installation and use low-grade epoxy. This is almost sure to lead to premature system failure and a waste of your hard-earned money. We are dedicated to delivering superior results with only industrial-grade 100% solids epoxy and careful floor prep. Here’s what you can expect from our licensed installers. Epoxy won’t adhere to damaged concrete. If your concrete has holes, cracking, spalling, or other forms of damage, our epoxy garage floor installers will make sure your concrete is patched and repaired before the epoxy installation. Epoxy bonds best with concrete that’s clean, smooth, and porous. Whether your concrete is new or old, it’s important to profile the surface and open the pores with diamond grinding, which removes imperfections and leaves a smooth surface ready for an epoxy coating. A strong and long-lasting epoxy garage floor is comprised of several layers starting with the primer. Before applying your garage epoxy coating, we apply a primer and allow it to sit. The primer penetrates the concrete substrate and helps the epoxy coating bond with the floor. Don’t trust garage epoxy contractors whose prices seem too good to be true. You will probably get a low-grade epoxy that isn’t made to last, even if it’s installed correctly. We use only the best garage floor epoxy coating products that are formulated for even the most demanding environments. How do you envision your new garage? As a yoga studio? Workshop? Man cave? Bring your vision to life with limitless design options. Our Austin epoxy garage floor installers can create a custom design, add a logo to your floor, or create an elegant 3D metallic epoxy garage floor with the illusion of movement. DIY garage epoxy won’t last long. While it may seem like a bargain, you’ll end up reapplying the epoxy every year or two and dealing with damage and stains. Professional garage floor epoxy can last up to 20 years thanks to our superior 100% solids epoxy products and careful floor prep. We use only superior epoxy products to deliver a floor system that can withstand even heavy abuse. It’s hard to damage a properly installed epoxy floor which can handle hot tire pick up, chemical spills, gas and oil, water, heavy objects, abrasion, and much more. Want a low-cost solution to both expand your usable space and increase the value of your home? Garage floor epoxy is a great choice. Professional garage epoxy offers an excellent return on your investment with a lifespan of up to 20 years. It’s also affordable with a cost that can be lower than $5 per square foot. You may be tempted to try a DIY epoxy kit you’ve seen for sale at a big box home improvement store. Make sure you know what you’re buying. These kits can cost a few hundred dollars and include a mild acid wash to prepare your concrete plus an epoxy coating that’s probably 40-60% solids. These kits can look decent at first but the floor tends to fail after just one or two years. Acid washes aren’t enough to prep your concrete floor and ensure good adhesion of the epoxy. Repairs followed with diamond grinding is necessary to profile the surface, remove imperfections, and open the pores of the concrete. The second problem with these kits is the low-grade epoxy. 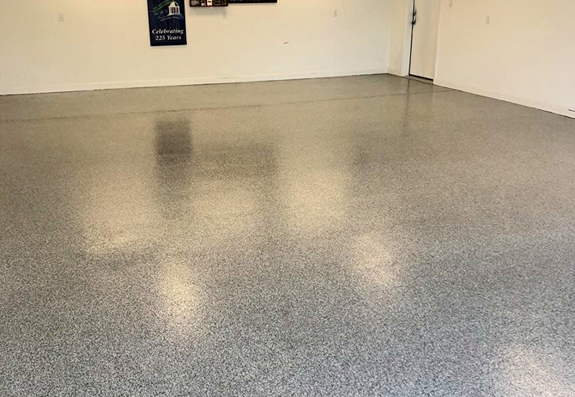 Our epoxy garage floor installers in Austin, TX use only industrial-grade 100% solids epoxy that delivers long-lasting results and the strength to withstand hot tires, chemicals, oil spills, and much more for up to 20 years. Professional installation is an investment in your home that doesn’t cost much more than DIY kits after the first few years with far superior strength and longevity. A flake epoxy system is one of the most popular decorative options for epoxy flooring. We use 100% solids epoxy and your choice of color flakes to give you a low-care and seamless floor with texture and visual interest. Flake epoxy creates a very safe, slip-resistant floor and it can resemble granite with flakes broadcast evenly over the surface. Want to really make an impression? Nothing compares to the elegance of a metallic epoxy garage floor. We add metallic pigments to your floor that are agitated with solvents, brushes, blowers, and other techniques to make the pigments clump and swirl. This creates the appearance of depth and movement with a 3D, pearlescent look. Only experienced epoxy garage floor installers should attempt a metallic epoxy application to get the look you’re going for.